Millions of Dollars in Unclaimed Cash: Does Any Belong to You? Millions in Unclaimed Cash: Does Any Belong to You? A long-forgotten utility refund. An old bank account. Stock you may never have known an employer put in your name. Taken each on its own, it may not be a lot of money. But add up all 13 million unclaimed accounts referred to Florida's chief financial officer, and it adds up to more than $1.5 billion. Accounts originating in Miami-Dade and Broward counties total more than two million, and hold about $600 million in them. "Unclaimed banking accounts, checking accounts, savings accounts, CDs, mutual funds, stocks bonds, utility deposits," said Walter Graham, unclaimed property bureau chief, rattling of the most common types of forgotten valuables. "We do have a lot of large accounts and I mean tens of thousands of accounts holding well over $50,000, $100,000 or even greater." But those are the exceptions. Statewide, the accounts average about $120 each; in wealthier South Florida, $300 each. Some familiar names can be found in the latest release of unclaimed property. Marco Rubio, who's been a tad busy running to be the next leader of the free world, has $30 waiting for him when he gets back to more mundane endeavors. The money is from a company that allows one to save money for college. 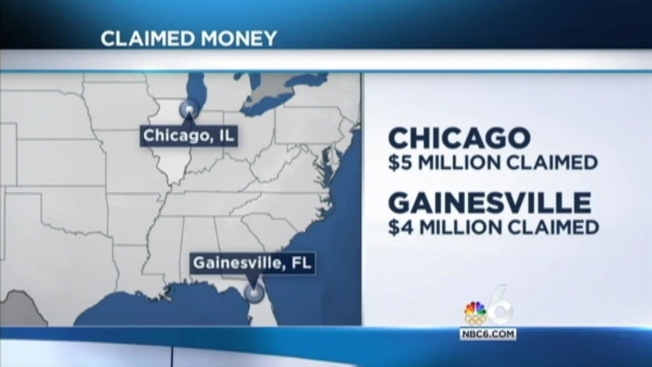 A Jeb Bush of Coral Gables has $54 to claim, money related to a golf equipment company. The chief tormentor of Bush and Rubio campaigns, one Donald J. Trump of Palm Beach, has no money unclaimed under his name, but his daughters and companies are owed about $2,000. Dwyane Wade has about $600 being held by the state. Not a lot of money for an NBA superstar, but money nonetheless. Click here to search your name to see if you're owed money.